Brand New Software Makes Business Intelligence Processes Much Easier! Business Intelligence (BI) simplifies daily work in companies worldwide: Complicated data is put together reasonably, gets evaluated and can be used for a set target. But until now there was no standardized approach because every BI-project is different and the common systems hardly allow the reuse of program parts. Nevertheless the demand of BI-solutions continues to grow and BI-consultants face high, individual customer needs. Regarding this problem the Austrian Start-up company Business Intelligence Accelerator from Hagenberg has a revolutionary solution: Its software of the same name is a Visual Studio Add-Inn, which generates custom-defined settings and efficient guidelines for a standardized use of different BI-projects based on Microsoft technology. The innovative software Business Intelligence Accelerator (BIA) can be used where ever data needs to be extracted, loaded or transformed. So called SQL Server Integration Services (SSIS) packages know how the data needs to be extracted and transformed. Until now these packages had to be put together manually – a potential source of error and a time consuming process. The Business Intelligence Accelerator is a set of modules, which allow the generation of Microsoft SSIS-packages from predefined templates. Time consuming generation and servicing is not necessary, this is reducing time and cost, not only in the development, but also in running the system. Currently BIA supports Microsoft SQL Server, SAP (separate license from Theobald Software GmbH is necessary) and Flatfiles – the list of supported providers is continuously extended. 1) Many possible templates are already within the scope of supply. These cover the most common integration scenarios. It´s also possible to create a custom made template. 2) The SSIS-generator creates templates automatically. Should there be a change on the ETL-process, may it be the templates or the source system, the packages are updated. 3) The user is creating a complete, totally up to date documentation of his Data Warehouse. Soon Markus Krenn, CEO of the Austrian company and Microsoft Gold-partner, will present the revolutionary software to an international audience for the first time: in Toronto, Canada at the Microsoft World Partner Conference, which takes place from July 8 to 12, 2012. The founder and owner of the Hagenberger company, works as a BI-consultant himself, has a lot of experience and knows exactly what is needed. In cooperation with the Erfinderhaus Patentvermarktungs GmbH he is now looking for partners who will support the trend-setting project. The United States Patent and Trademark Office (USPTO) announced plans to open regional USPTO offices in or around Dallas, Texas, Denver, Colorado, and Silicon Valley, California. These offices are in addition to the already-announced first USPTO satellite office to open on July 13 in Detroit, Michigan. The four offices will function as hubs of innovation and creativity, helping protect and foster American innovation in the global marketplace, helping businesses cut through red tape, and creating new economic opportunities in each of the local communities. The offices will help the USPTO attract talented IP experts throughout the country who will work closely with entrepreneurs to process patent applications, reduce the backlog of unexamined patents, and speed up the overall process, allowing businesses to move their innovation to market more quickly, and giving them more room to create new jobs. Selection of the four sites was based upon a comprehensive analysis of criteria including geographical diversity, regional economic impact, ability to recruit and retain employees, and the ability to engage the intellectual property community. The Leahy-Smith America Invents Act of 2011 (AIA), signed into law by President Obama in September, requires the USPTO to establish regional satellite locations as part of a larger effort to modernize the U.S. patent system over the next three years. Smartphones need smart jeans. Alphyn Industries just devoloped them. 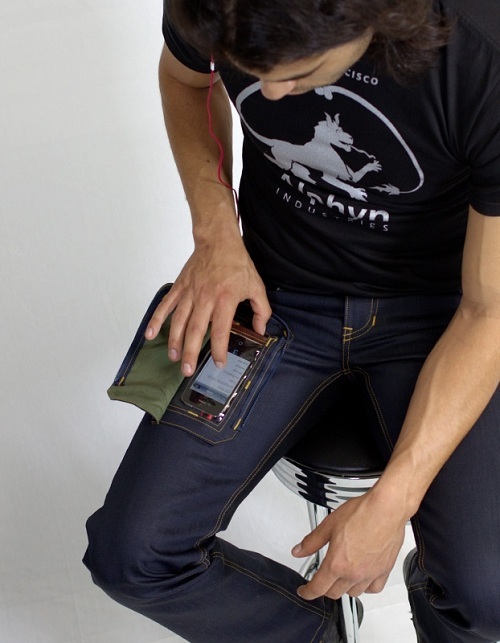 The DELTA415 jeans feature our Gen-2 Wearcom™ smartphone pocket with a zippered flap for a more discrete look, secure and easy retrieval, and full usability of the smartphone while sitting down, the company writes on its website. You just can´t wait to leave the office and enjoy the weekend? Here is a nice little gatget to speed up. 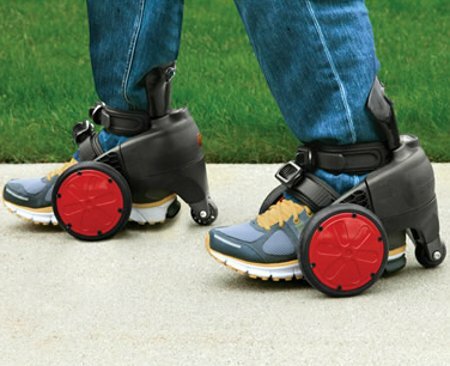 According to coolest-gadgets.com the Electric Skates are motorized electric roller skates which are able to propel a wearer at a top speed of up to 8 mph. All you need to do is strap the skates on over your shoes, ensure the dual fasteners are securely and sufficiently tightened, and let the 80-watt motor on each skate get to work. With a handheld wireless remote control you can adjust the speed. Looking for a new hobby? Or a funny transportation system? Check this out! 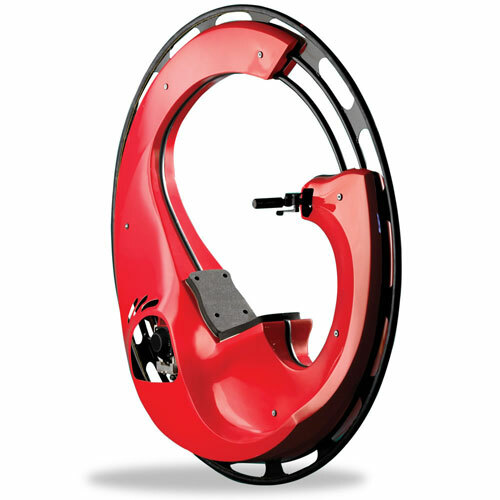 The Motorized Monocycle called Wheelsurf propels a single rider up to 25 MPH and can be purchased at hammacher.com. The wheel operates by using a centrifugal clutch on its inner steel frame to engage the larger outer flywheel that actually makes contact with the ground with a rubber tire. The ingenious device is steered by leaning to one side or the other, and it can safely negotiate any dense surface such as pavement or grass. A fiberglass frame encloses the engine, drive train, and fuel tank, and provides a cushioned seat and convenient footrests for riders. It´s sure nice to ride, just keep in mind that it´s not a street-legal vehicle. Are you tired of cleaning your home just because people can´t take off their shoes and spread dirt all around the rooms? Wouldn´t it be nice to have a door mat which automatically cleans the shoes of every person coming in? 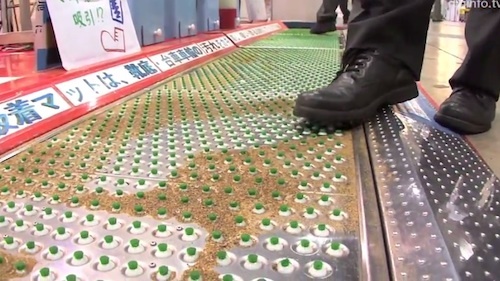 The Japanese invention vacuums dirt from the soles of shoes as soon as somebody steps on it. As described on designtaxi.com the dirt gets collected in a container while your rooms stay clean. Just watch the video to see how it works! Have you been in a fight with a ketchup, mustard or mayonnaise bottle lately? Just watch the video below and you will know what we are talking about. It is really a nasty problem but as you could see, help is on the way. Want to know more about the new condiment lubricant that makes the inside of bottles so slippery, nothing is left inside? InventorHaus, Inc. offers you a great job opportunity! Looking for a nice location to have dinner with some friends? Ever thought of dining way up high? Above Las Vegas for instance? Here is an innovative idea! 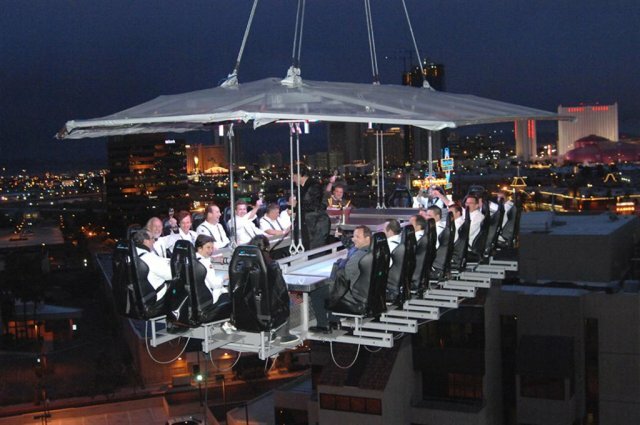 Dinner in the Sky, as you can read on the homepage, is hosted on a table suspended at a height of 160-180 feet by a team of professionals and may accomodate 22 people around the table at every session with three staff in the middle. By now Dinner in the Sky is available in more than 35 countries worldwide. Curious how the guest get lifted up? Then watch the video from „Sin City“! Do you like Italian food and pizza is your favorite choice? Soon you can get yourself one in less than three minutes. 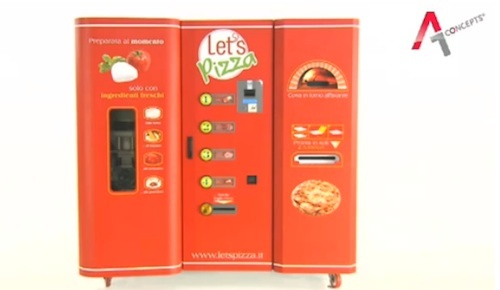 According to an article on pizzamarketplace.com Let’s Pizza, a European company will be debuting pizza vending machines in the US this summer. The machine which creates pizzas from scratch was the idea of Claudio Torghel and is distributed by A1 Concepts, based out of The Netherlands. It „contains a specially developed bag of flour and a bag of mineral water. Every time you order a pizza, the machine will start making the dough, then shape it into a crust, and top it with organic tomato sauce. Next, one of the toppings is placed on top and the pizza is ready for the oven“, A1 Concepts‘ CEO Ronald Rammers says.